A solar funnel made from a Tesco funnel and back screen projection material kindly provided by Windsor Displays was used to observe the huge sunspot group AR1520. This sunspot was just visible to the naked eye through eclipse viewers. This would seem to be an ideal way of sharing the viewing of sunspots at public displays. The dangers are almost completely eliminated but all solar observing equipment should never be left unattended, and its use should be closely supervised. The sunspot viewed here (AR1520) currently has a delta-class magnetic field that could give rise to X-class solar flares which could lead to auroral displays even at this time of year as well as to other magnetic disturbances. 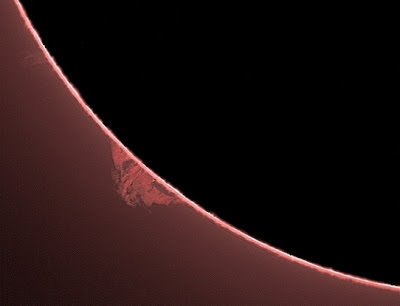 A 5000 frame AVI was captured of a prominence using a 2.5x Barlow. 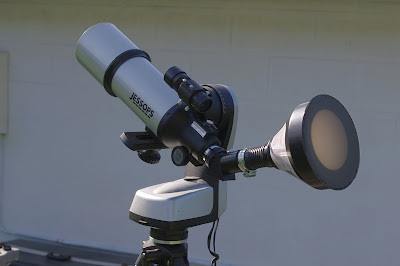 A virtual occultation disk is used to hide the glare of the overexposed disk.